There should be nothing blocking you from purchasing this cheap and lovable arcade classic. The last time Taito revived an arcade franchise for a handheld system, we ended up with the lackluster New Zealand Story DS, a platformer that has nothing working for it. Thankfully, that's not the case with Arkanoid DS, a retro redux that plays great, despite some annoying issues. In the game, the paddle you control at the bottom of the screen is actually an oblong spaceship called a Vaus. It cruises through the galaxy minding its own business when a tough alien force known as Doh (no mention of Homer Simpson) gets in its way with playfield upon playfield of blocks. You go through each stage, bouncing a ball back and forth and smashing through the blocks until they disappear. Arkanoid DS has two main control options, and one works incredibly well over the other. You can either use the touch-screen to move your Vaus back and forth, or you can use the old-fashioned d-pad set-up for left and right movement, while occasionally tapping buttons to interact with certain power-ups (like a ship extender or a handy laser weapon). The stylus control is more interactive, and better suited for a game such as this than the typical d-pad. Sadly, the neatest control option of them all, a paddle peripheral that plugs into the Game Boy Advance port, didn't ship with the US version. Those who imported it, however, will find that it works just fine with this edition. Along with playing through 140 levels of block-smashing action, there's replay value galore. You can customize your backgrounds and music by going into an interactive shop with points earned in the main Clear Mode and buy things, such as a hardwood backdrop or a funky synthesizer beat that sounds as if it belongs in a dance club. Some backgrounds work better than others, but they're a nice addition. 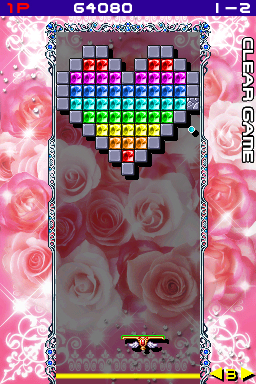 Arkanoid DS also supports multiplayer, allowing four players to play competitively with just one cartridge through Download Play. Highly skilled players can also upload their high scores through the Wi-Fi Connection, seeing how they compare with other Vaus handlers. Gameplay remains the same throughout, but there's lots of brick smashing to do. Clear Mode contains over 140 levels to go through, and the game adds even more diversity with Quest Mode, where you complete individual challenges before time runs out, such as breaking the required number of bricks with a certain number of hits. For $20, Arkanoid DS isn't just a steal, it's a requirement. It's fun, it looks and sounds great and it has options for both the solo and multiple players. Get to paddling already.